A woman has died after being found unresponsive in the sea shortly after leaving a nightclub. Bethany Skinner, 22, from Bognor Regis, was pulled from the water near the town's pier, by lifeboat and coastguard teams in the early hours of Sunday. She was taken to hospital in a critical condition and died on Tuesday. 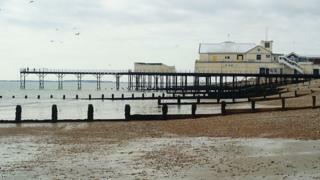 Sussex Police are investigating the circumstances of how she ended up in the sea after spending Saturday evening at Sheiks nightclub on the pier. A man who went into the water to try to assist her was also taken to hospital to be checked over, and later discharged. In a statement on its website, Sheiks nightclub said staff had tried to rescue Ms Skinner after she ended up in the sea shortly after leaving the club with a friend at 02:00 GMT. It appealed to any of its customers who may have seen anything or who were in the beachfront area at that time to contact police with information.